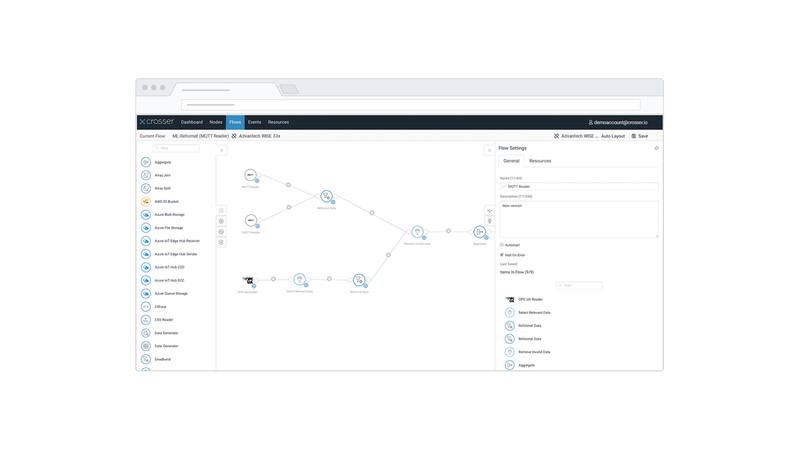 The Flow Studio is a drag-and-drop visual design tool where you select and connect pre-built building blocks called modules to develop your flows, and the Flow Studio is a central component in Crosser Cloud. There are three main types of modules, Collector, Compute and Action modules, in a rich and ever-expanding library of modules. There is also an open SDK that allows you to build your custom modules. Sandbox - Test the flow in a sandbox node in your cloud account. Version history and control - A deployed flow can´t be changed without creating a new flow version. Mass deployment through the Edge Director - Deploy a flow to an unlimited number of edge nodes in one single operation.